I had the great pleasure of being a co-author in the anthology in which Johnathan Alvey made his first public appearance. Now, the amazing Mr. R. M. Ridley has started us on the dark road that will follow Alvey through the White Dragon Black series of novels. 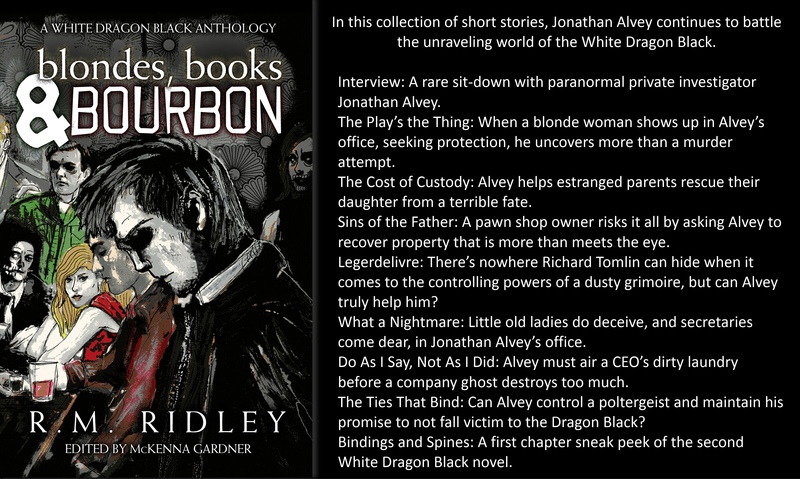 Ridley’s latest work, Blondes, Books and Bourbon, brings us back to the short story format in a collection of stories from within the White Dragon Black universe and staring your favorite embittered, brooding detective, Johnathan Alvey. I’ll be honest, the level of dark paranormal and surprisingly detailed real-world mysticism in the WDB series is on the edge of what my sensitive self can handle. But then again, so are some of the things that I write myself… It is really Ridley’s talented writer that keeps me coming back for more. What I really love about Ridley’s writing, is that it’s not all about the magic and the occult. At it’s heart WDB is really about the life and struggle of Alvey, trying to make a difference, while struggling with the figurative inner demons that threaten to slowly strangle him (though there are also plenty of not-so figurative demons with the same goal). 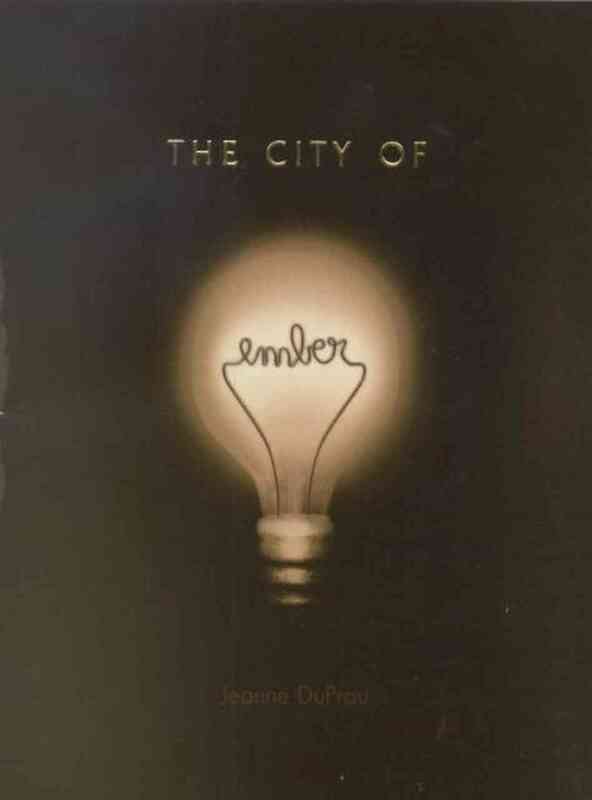 The City of Ember by Jeanne Duprau is a delightful young adult read. The main appeal of the Duprau’s tale is the sense of mystery that pervades everything about her cleverly constructed world. In the tale, carefree and impetuous Lina Mayfleet, and her classmate, the more convicted and determined Doon Harrow, find themselves caught up in a centuries old mystery. In the process they become entangled in blackmarket dealings, political malfeasance, and the selfishness of humanity as their aged city begins to fail. As a parent I really appreciated the value of truth and virtue presented by Duprau in the story. Throughout the book Duprau touches on the unbecoming responses of humans to an ominous future, covering the gambit from deluded activists, self-serving opportunists, and resigned gluttons. Interestingly, throughout all the plights and struggles against the baser human nature, there is a thread of hope and promise that is closely tied to virtue, and compassion. Traits that are clearly praised in the book are dedication, passion, thoughtfulness, and family ties. If I were to over-analyze the book for its theological grounds I would say that it takes a rather hopeful agnostic approach to the existence of God and things of eternity. As a Christian, I was a little worried that the ‘believers’ presented in the world would be used to disparage the undeniably similar Christian faith as some other authors like to do. As it turned out, the believers, while mistaken and perhaps self deceived into apathy toward their plight, were not ridiculed nor were they presented as the worst of human nature in the face of slow impending doom. Despite seeming to quietly dismiss the self willed false-hope of the believers, Duprau consistently points to a hope beyond human invention, something tied to the creation, growth, and the progression of life. I would heartily recommend this tale to any young reader as it is full of mystery, adventure, and virtue. But, as a writer, I cannot help but to also critique the story. Please note the difference between critique and criticism. There are flaws and missteps in every novel. I like this story and it is in most ways a better work than I could produce. When I look for flaws, I’m not trying to disparage the author, but trying to better my own writing and nothing more. The following is my critical analysis of what Duprau, perhaps, could have done better and where the flaws in the book lie. SPOILER ALERT! My biggest concern with ‘The City of Ember’ is that Duprau seems to have written herself out of her intended trilogy. 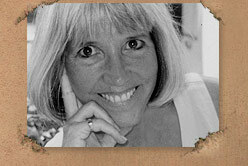 The entire appeal of her story is in the world which she so thoughtfully developed. Her characters are decent, but not the most vivid I have read, and her narrative voice, while clean and uncluttered, is not a strength that would bring me back to a sequel in and of itself. To me the appeal of Ember is the mystery of the world; how it works, why it was made, who made it, and how it will survive. But by the end of the tale Duprau packages all of that up (rather satisfyingly) and puts it away. Where is there to go from here? I’m not sure, but the hints I got from the end of the book, and the sneak peak of the sequel don’t give me much hope for another world that could possibly be as engaging as the City of Ember. It’s hard to complain too much about plot in a book written for young adults, but I will note that the occasional dues ex machina is employed to circumvent problems or move the plot along. Some that come to mind are, convenient black-outs, learning how to strike a match, learning of the word ‘Egress’ (which I can’t imagine anyone ever actually using as was done by the Builders), and Doon’s discovery of the E on the rock. Oh, and I almost forgot finding the cliff in the cave above ember from which they could drop their note . . . I liked the happy ending, and the imagery to the scene, but it was ridiculously lucky of the characters. Likewise, I like a little more symmetry and mirroring in my fiction and there were a few loose/dead ends that could have been better employed. I liked Lina’s bean sprout, and Doon’s moth, but the were ultimately very diffuse in their allegory and didn’t connect much with the plot. The whole red herring with the secret store room in the pipeworks would have been more satisfying if it had been later employed somehow as a mechanism for Doon and Lina’s escape once the truth was discovered. Another device not terribly well used was the death of Lina’s grandmother. In the immediate sense it was used to help break Lina’s ties to Ember, and to both show Doon’s sensitive character and build the bond between him and Lina, but after that, it is nearly forgotten, which is odd for such a life changing event as the death of a caretaker and guardian. There were a few places where the action picked up that I thought the author did some ‘head-hopping’, but overall the writing was very solid even if it lacked flare. While the characters were well developed the narrative voice felt reserved and the images of the characters in my mind were seldom as vivid as the feel of the city itself. For a first novel ‘The City of Ember’ is very good. Like I said, I think Duprau’s strengths are in her world building and sense of mystery. 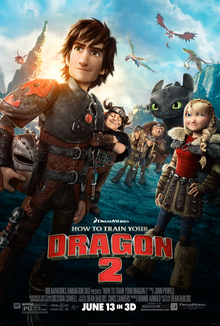 Second to that comes plot, followed by character development, and finally narrative voice. If I were to advise Duprau on her next novel (for which it is already too late) I would suggest making the most of her strength in world building and working up a sense of mystery as the key hook to the story, and then to really focus on improving her narrative voice to give it more character and make it more engaging to the reader in and of itself. Overall the City of Ember is a great read, and an excellent first novel from Jeanne Duprau. See more reviews and comments on . This is a critique of the Eighth and final in the steampunk anthology ‘Mechanized Masterpieces’ edited by Penny Freeman. The purpose is not to show all the mistakes and short comings, or say that I am a better writer, because clearly I’m not. This is simply an exercise in critical reading with the goal of improving my own writing, and encouraging great writing from any reader that passes by. This is a critique of the seventhstory in the steampunk anthology ‘Mechanized Masterpieces’ edited by Penny Freeman. The purpose is not to show all the mistakes and short comings, or say that I am a better writer, because clearly I’m not. This is simply an exercise in critical reading with the goal of improving my own writing, and encouraging great writing from any reader that passes by.